Gun violence is a major issue in the USA. America is a huge sufferer of the gun violence. Lately, there was a pattern developed i.e whenever a mass-shooting happened, people started talking about the gun laws and the conservatives use to shut the talks out. They usually did it by saying that it was not appropriate time to start a political debate at the time of the tragedy and then everybody moved on till the next shooting. But recently this pattern broke down when kids decided to take matters into their own hands and started demanding the change to ensure the protection of schools. Many people who are pro-gun saw it as a propaganda by the left wing, they claimed that the kids are being used by them as a pawn in their anti-gun campaign. The leftists claim that the only solution to the problem is taking away the guns or at least making sure that there are more intensive background checks so that the people who intend to do public harm couldn’t get their hands on the weapons. It is a complicated matter, it is very hard to find a middle ground. Because many feel it’s their God-given right and they don’t want anything infringing this right. They are even suggesting that teacher should be armed and whoever intends to do harm will find a way. One way or another, everyone agrees that there must be a stop to the gun violence. The politicians seem to be doing everything except focusing on something concrete. The role of students in history is very much evident from the history of the country, they do have the power to bring the very much needed change. And it seems like the time has finally come to do just that. The Florida shooting left 17 students and staff dead. This sparked a “Never again!” movement, which demanded strong gun laws so that they don’t have to ever run for their lives from such attack. Last Wednesday, the movement spread to other states as well. Many students from all over the different cities joined them at 10:00 Pm leaving the classrooms empty. 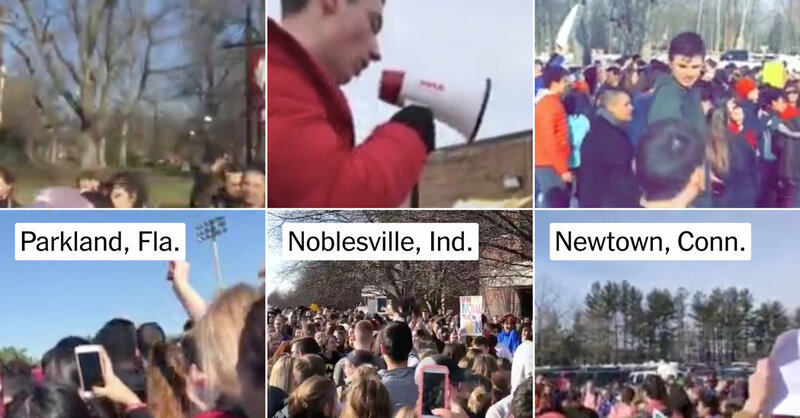 This a major coordinated movement since the Parkland shooting. We have grown up watching more tragedies occur and continuously asking: Why?” said Kaylee Tyner, a 16-year-old junior at Columbine High School outside Denver, where 13 people were killed in 1999, inaugurating, in the public consciousness, the era of school shootings. “Why does this keep happening? In Florida where the protest took place, the governor signed a bill that raised the minimum age to 21 and set a waiting period of three days. On the national level, however, no impact has been seen as the Republican-controlled Congress seems reluctant. But for the past days, the students seem to have a huge social media impact. But as always, there was a divide among the general public, some school administrators and parents. Some are supportive while others were not claiming that guns are not the problem but the people are.